These ideas can be used in any class, or any subject, but arose as a solution to a specialist situation. Specialist teachers have such limited time with students—and so many students—that getting an overview of students’ learning becomes a perpetual challenge. My colleagues and I have been wondering how to get a better understanding of the students’ understanding, and looking for ways to consolidate and solidify the learning at the end of each class. At the same time, we have been having discussions about how to make parents more aware of the wonderful learning that happens in Music. After a lot of discussion, we came up with something that ticks ALL these criteria. And on top of that, the kids think it’s really fun! We call it “Music Reporters”. In a nutshell, the students are responsible for capturing the learning that goes on during class and summing it up at the end. 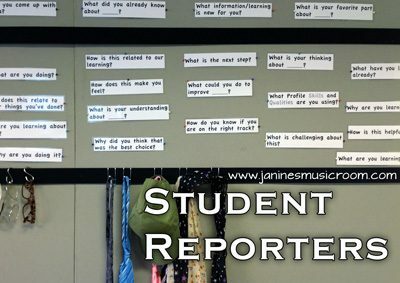 We put students on a rotation—four or five students in each class—and they will have a chance to be the “reporters”. I bought some neckties, scarves, and hats at the dollar store, and now I am thinking to fashion a media pass that the students could wear as well. This little bit will do a lot to help the children get into their role. We reserved some time at the end of class for the reporters to share what they found. The intention, then, is that we can do a brief write-up as a class of what learning took place that week. This can be shared with the parents on our class blog. Here is the consolidated list of the questions our reporters wanted to ask in order to find out more about what the students and thinking and learning. These could be great prompts for metacognition and reflection in any subject area. We have them on the wall by our reporter accessories. The reporters loved their special role, and the other students loved being interviewed! This was great for metacognition, as the reporters were thinking differently, and the other students were stopping to think more carefully about how they described their experiences. And with the students summing everything up at the end of class, I can more easily identify student misconceptions or tangential inquiries. I think this has a lot of potential! What are your strategies for getting a picture of your students’ deeper thinking?